Gibraltar is an overseas territory of the United Kingdom. It is located in at the entrance of the Mediterranean Sea. It is the ideal destination for adventurous tourists. You can explore the caves and the tunnels, but keep in mind that the inside of the rock is very intricate, and you may feel like in a labyrinth. Other than that, you can spot dolphins and Macaque monkeys, but one of the things you have to do while in Gibraltar is to take the Mediterranean Steps. It is a long walk to the top of the rock, but the view is breathtaking. You get a feeling that you can see both Europe and Africa from up there. It is an experience that you will never forget. Before you take a trip to Gibraltar, you need to check if you need a visa or not. As mentioned above, Gibraltar is British Overseas Territory, which is why you need to refer to its visa policy. Even so, you will be happy to learn that you may be among the many visa-exempt nationalities. If that is the case, you can go to Gibraltar without a visa as long as your stay does not exceed 90 days. All the other nationalities must obtain a visa at the nearest British diplomatic mission. In order to find out if you are visa-exempt or not, you can read the visa policy itself. But we suggest that you use iVisa’s Visa Checker. It is a lot faster and more convenient than reading a policy. All you have to do is click on the Visa Checker button you see in the top right corner and fill in the boxes. You must select your nationality from the drag-down menu on the left, and on the right, you must choose Gibraltar as your destination. The result will tell you if you need a visa or not, and if you do, you will be given some useful information such as a list of the nearest embassies where you can apply. 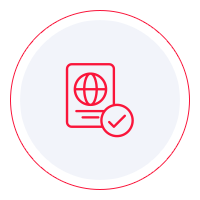 Since electronic visas are not an option, in this case, iVisa does not process applications. Should that change in the future, we will let you know. Until then, all we can provide is information, in which case you can contact our support service 24/7. The service is free of charge. One other thing that you should do before you go to Gibraltar is to learn about the visa requirements. You can find a lot of information online, but we advise you to use it as a reference only. The info you see online is not always the most reliable. In consequence, we recommend that you call the issuing authority and ask your questions there. They can give you the most legitimate answers. Meanwhile, what we can tell you is that all travelers who take a trip to Gibraltar need to have a passport that does not expire for at least another 6 months from the date of arrival. We are sorry that we cannot assist you further in getting your visa for Gibraltar, but we hope that the information above points you in the right direction.